In games that really are starting to matter for the Wizards, it just seems they can’t find the right combination to keep them in the spot they need for the playoffs. 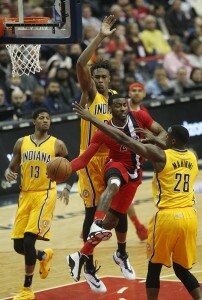 Tonight it was the Pacers and Paul George that delivered the 10th place Wizards another disappointing loss at home. George scored 38 points, including two free throws with 3 seconds left to lift the Pacers to a 100-99 victory over the Wizards on Saturday night. “We could be positioned a lot better than where we are,” George said. “Of the eight playoff teams … I don’t think we should be below the four. John Wall did everything he could in the fourth quarter to carry the team on his back after Bradley Beal exited the game after a hard collision with the basket stansion in the third quarter. Wall had 25 points and 12 assists for Washington, which began play 1 1/2 games behind seventh-place Indiana. Washington, which had won six straight at home, managed just 35 points in the second half. Jordan Hill’s two free throws gave Indiana its first lead since the first quarter, 86-85 with 8:20 left. Wall then converted a pair of three-point plays — the second after he made an acrobatic layup and was fouled — to give the Wizards a 93-91 lead. George’s 3-pointer later pulled Indiana to 97-96. The Wizards have a long road trip coming up with the ACC Tournament in town and will need some luck on the road if they hope to tighten this race, otherwise there is a strong chance they could be looking at the playoffs from the outside this season.